TOKYO, Dec 10 2012 (IPS) - When Hiroko Taguchi retired this past April, at the age of 64, from her job as an insurance sales agent, she joined the rapidly growing ranks of Japan’s aging women who now outnumber their male counterparts. Taguchi, a divorcee who lives alone, is heavily dependent on her pension to support what will likely be a lengthy retirement, given that women in Japan live, on average, about seven years longer than men. A survey conducted earlier this year by the Health and Welfare Ministry revealed that women account for 87.3 percent of Japan’s record number of 50,000 centenarians. “I am lucky I did not quit my job when I married, as was the norm for women of my age,” Taguchi told IPS. Indeed, she is one of a very small number of women in Japan for whom old age is not synonymous with poverty and loneliness. Most of her contemporaries who were part-time workers or full-time homemakers in their youth and middle age now draw monthly public pensions of just 500 dollars or less – barely enough to cover their living costs. A patriarchal social structure that has boxed women into the role of caretaker and homemaker is largely responsible for the vulnerable situation many old Japanese women now find themselves in. According to government data, 70 percent of women leave their jobs when they start a family, returning to the workplace – often as part-time workers – only when their children are older; this pattern significantly reduces their chances of drawing a decent pension after retirement. Additionally, the fact that women are experiencing increasingly long life spans means that many outlive their husbands and become entirely reliant on the state welfare system. Social experts here say Taguchi’s sunset years provide a spotlight into the diverse issues that women in Japan’s graying society face today. 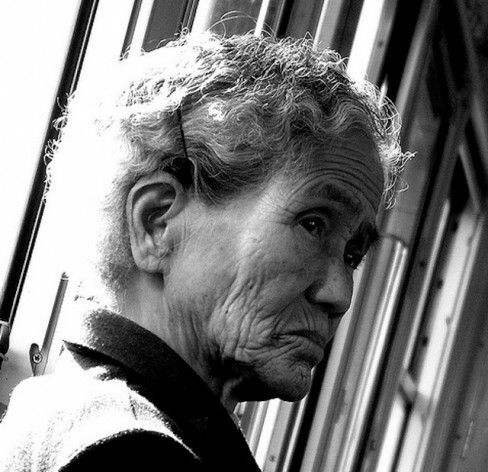 “More women than men face poverty in their old age given their (life spans) and lower incomes,” pointed out Professor Keiko Higuchi, an expert on aging populations at Tokyo Kasei University, as well as an advisor to the government on gender and policies that affect the elderly. Japan currently has the world’s fastest aging society. Experts estimate that by 2025 more than 27 percent of the population will be over 65 years old. If the present trends continue, experts predict that 40 percent of the senior population will be female: women are clocking 86.5 years, compared to 79.6 years for men. Higuchi, who is also a prominent women’s rights activist, has lobbied the government long and hard to develop policies that meet the needs of elderly women. Among the many issues that aging women face are loneliness, higher prospects of disability and growing poverty in a nation that is grappling with a huge public debt and threatening further cuts in social services and state welfare. Official statistics from the Health and Welfare Ministry confirm this grim picture – government data shows that 80 percent of those over 65 years and living alone are women, mostly divorcees and widows. Women also comprise 70 percent of the population in nursing homes, with poverty affecting 25 percent of the female population over 75 years compared to 20 percent among males. The Ministry also reported that in 2011 there were almost 420,000 women over the age of 65 who depended on welfare handouts, compared to 324,000 men. According to the prominent Japanese feminist Junko Fukazawa, who counsels women facing domestic violence – a risk she says is increasingly common for older women living with their husbands or sons – deep-rooted gender discrimination makes women even more vulnerable to the troubles of the sunset years. Social traditions that have forced women to take care of the family while men worked outside “is the prime reason why women give up their jobs when they have children, (and end up with) lower paying jobs and financial instability in their old age”, Fukazawa told IPS. “The situation is ironic,” she added, pointing out that those who have traditionally been the primary caregivers for young and old alike are now becoming a population that needs the most support. The critical need to focus national aging policies on women is gaining traction around the world. A new report, ‘Aging in the Twenty-First Century’, released in September by the United Nations Population Fund (UNFPA), calls on governments and other stakeholders to take heed of the mounting body of evidence that women are living longer than men, and adjust their national plans accordingly. The report documented figures around the world that showed that for every 100 women aged 80 years and over, there are only 61 men. Aging in Japan, the world’s third largest economy, illustrates some of these pressing issues against the backdrop of a shrinking working population, which is expected to plummet from 80 to 52 million by 2050. For the younger generation of Japanese women, who are coming of age during a time of government austerity and desperate attempts to reduce public spending, the forecast is alarming. Already this generation of women is beginning to feel the crunch of poverty, with Labour Department statistics pointing to a rise in lower-paid part-time female employment, a trend that indicates an erosion of retirement stability for a large portion of the labour force.